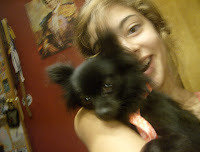 This is a picture of my daughter (The Diva) with her dog a papillon (Amanoute - Pocahontas' Native American name). She is a new addition to our home. Another dog means more dog food. Decided to go find some coupons, freebies and deals. Here are a few freebies for your pets. Hope you and your pets enjoy the free stuff! Receive your free sample of Dog Lover's Choice dog food. FREE: $1 off coupon Schmackos dog treats! Become a free Club Jungle member and get a FREE sample of our Start Right water conditioner. Get a free sample of the new dry lineup from Friskies for your cat. Get a free sample of Mighty Dog. Receive a free PAWA Power Pack DVD and brochure. Get a FREE SAMPLE of Treat People's healthy natural treat for your dog.